THE MACKENZIE-PEACE River system is made up of the Mackenzie and Peace rivers. Located in western CANADA, this is the 10th-longest river system in the world, at 2,635 mi (4,240 km). Sir Alexander Mackenzie, a Canadian explorer, discovered the river in 1789 and it was named for him. By itself, the Mackenzie River is the longest river in Canada, with a length of about 1,118 mi (1,800 km). At places it is 2 mi (3 km) wide. It starts in the Northwest Territories at Great Slave Lake and flows north into the Beaufort Sea of the ARCTIC OCEAN. 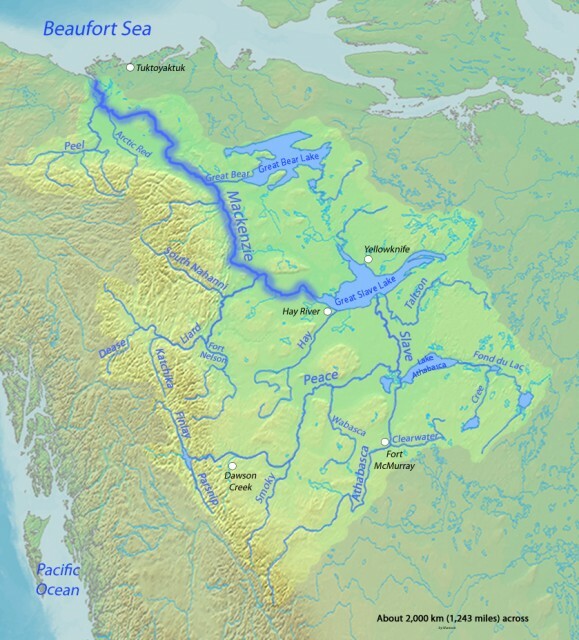 The Mackenzie-Peace River system drains .70 million square mi (1.8 million square km), about one-fifth of Canada, and includes Great Slave Lake, Great Bear Lake, and Athabascan Lake. Small ships can travel about 1,700 mi (2,750 km) along the Mackenzie-Peace Waterway. The river is navigable from about June until October each year. The rest of the year it is frozen over. The region where the river empties into the Beaufort Sea is known as the Mackenzie Delta. The area was once a large bay. Here land has built up from the sediment carried by the river and dropped as it slows down to enter the sea. The Mackenzie Delta is the largest delta in Canada and the twelfth largest in the world. Unlike most deltas, this one is confined by high landforms on both sides. The Richardson Mountains are to the west and the Caribou Hills are on the east. This keeps the delta from expanding in either direction. About 3,000 Inuvialuit live in the Delta communities of Aklavik, Inuvik, and Tuktoyaktuk. These Native Americans have made a comeback after being nearly obliterated by diseases in the early 1900s. The most important tributaries are the Liard River, the Peel River, and the Bear River. Most of the land along the waterway is not settled. Much of it is heavily forested. The small communities that do exist along the water are connected only by the river. There are no roads in the area. The most northerly of the Athapaskan-speaking people live in the boreal forests of the Mackenzie Delta and rely, as they always have, on the caribou for food and clothing. Muskrat trapping has also long been a part of the delta economy. Muskrats are plentiful in the many lakes on the delta. Other mammals found on the Mackenzie Delta include black bears, grizzly bears, moose, red fox, Arctic fox, snowshoe hare, Arctic wolf, and musk ox. Beluga whales winter in the Bering Sea, but enter the waterways of the delta in the spring. Tundra swans breed on the tundra, then migrate as far south as central California. Beautiful wildflowers cover the tundra during the brief summer. About 100 species grow here, including purple crocus; white, pink, and purple Indian paintbrush; yellow cinquefoil; blue Arctic lupins; and red, yellow, and purple sweetpeas. The delta contains deposits of minerals, gas, and oil. The Dene natives knew for a long time that there was oil along the lower Mackenzie River. They called the area “Le Gohini,” which means “where the oil is.” They finally showed the site to geologists in the early 1900s. The first oil well was drilled there by Imperial Oil in 1919, then a small refinery was built that supplied nearby communities with oil. In the 1940s, the U.S. Army helped with construction of a pipeline from the Norman Wells Oil Fields on the Mackenzie to Whitehorse, Yukon. They were afraid the Japanese would attack their west coast refineries. However, the war ended just as the pipeline was completed. In the early 1980s, production there reached full capacity. Today Norman Wells averages 10 million barrels of oil per year, Canada’s fourth-largest oil-producing field.